LARGE: sheet 24"x28.5", design 21"x23.5"
SMALL: sheet 24"x33", design 26.5"x21.2"
Trendy geometric stencil pattern "Maze Runner" will make a stunning accent wall! 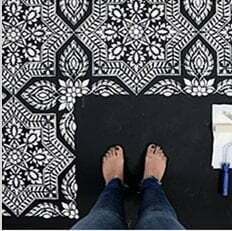 It is also great for stenciling sisal rugs and floors and even works great for stenciling curtains! Our stencils bring stylish elegance to any room. Geometric wall stencils are just perfect for contemporary decor. This stencil was named by Jen from the Four Marrs One Venus blog, who won our stenciling naming contest! We offer this stencil pattern in 2 scales, large and small. Choose the large scale for larger rooms and rugs and the smaller one where a tighter scale is needed. We find that it is not necessary to use spray adhesive with our stencils. However, if you want to minimize paint seepage or are using high contrasting colors, adhesive is very helpful (Elmer's spray adhesive seems to be the best). Make sure you shake the can well and lightly mist (not drench) the stencil, and let it dry for a moment before positioning it on the wall. This step will prevent the adhesive residue transferring to the wall. You'll need to re-mist the stencil after a few repeats. Clean-up tip: Spray the stencil with Simple Green to help to remove adhesive residue. And make sure you watch our short step-by-step <ahref="how-to-stencil-videos.html" alt="how-to-stencil-video">Video Tutorials!